I completely understand that choosing the right website builder is no easy task. With that in mind, I’ll do my best to help simplify things by rolling up my sleeves and getting stuck into Wix and comparing it directly to GoDaddy’s GoCentral offering. As both companies have a strong focus on helping small businesses get online, I’m as intrigued as you are to see who comes out on top! If you’re in a hurry, simply click on any of the links in the overview below and you’ll be able to jump to the relevant section. 1. Who’s Design Templates Will Suit You Best? 2. 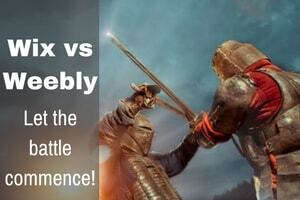 Which is The Easiest To Use, Wix or GoDaddy? 4. How Will Your Site Look on Mobile Devices? 6. Which Is The Best For Blogging? 8. Customer Support – Who Has Your Back? 9. Pricing – Which is The Best Value For Money? There are plenty of website builders out there that only offer a handful of templates and you’re expected to bend them to fit your requirements. That’s not something you have to worry about with these two! Wix had over 500 templates the last time I counted and they cover everything from local service businesses, to online stores, to blogs, portfolios and wedding sites. The templates are a lot more customizable than GoDaddy’s but just be warned that too much freedom isn’t always a good thing unless you have an eye for design. GoDaddy also has a huge range of over 300 templates that you can use as a starting point for your site which covers a wide range of industries such as business, restaurants, and shopping. They’re designed to a very high standard and have some great quality stock images just in case you don’t have your own. However, I was a little disappointed as I feel the templates are quite rigid and you can only really customize basic elements of your site. Once you’ve chosen a template, neither website builder lets you swap it. Well, actually you can but your content won’t carry over and you’ll be basically starting from scratch. Design template summary: Both Wix and GoDaddy offer more templates than most of their competitors. Wix’s are more customizable to help you match your brand but neither allows you to change your template without starting over. Wix and GoDaddy are no strangers to large advertising campaigns and one of the main points they push is how easy their platform it is to get up and running. After reviewing them individually, I can tell you that they’re both true to their word although they do work in slightly different ways. Wix is a true drag and drop website builder which allows you to pick up elements such as text and images, and move them to wherever you wish on the page. It’s a sense of freedom that you don’t often find with other website builders including GoDaddy. When you first get started with Wix, the website editor does feel a little more cluttered in comparison and the tools are scattered around the screen. Having said that, all of the tools are clearly labeled explaining what they do and so it shouldn’t take long to find your way around. One feature that Wix has that GoDaddy doesn’t, is the ability to create your website using artificial intelligence which is a more hands-off approach to website creation. It’s not perfect and you’ll still need to do some final editing, but it’s a novel way to create a business website. With GoDaddy, you create your pages by adding pre-made pieces of content called “sections”. These sections include, about, contact and menu’s etc. 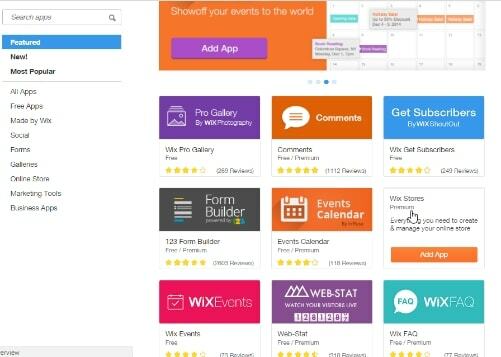 Ease of use summary: Both builders are easy to use, Wix has a wider array of tools but they’re a little more scattered and it may take you a little longer to find your bearings. GoDaddy’s tools mainly reside in the main control panel on the right-hand side of the screen. When it comes to tools to help you create your website, it’s hard to beat Wix. You can add image galleries, video, social media buttons, contact forms, buttons, boxes, a blog, and even a store directly from the main editor. You’ll also have access to an App Market where you can go to find even more features such as online booking forms, invoicing software, live chat features, membership & forum capabilities, newsletter tools and we’re only just scratching the surface. Some apps are free, some have additional costs attached. GoDaddy offers many of the main features you’d expect when it comes to adding functionality to your site such as social media integration, pricing charts, testimonials, contact forms, Google analytics (visitor stats), and email newsletters. If you’re based in the US, you’ll also have access to their booking form which will allow customers to schedule their own appointments (not currently available anywhere else sadly). However, they try to keep things simple and not overwhelm and so you won’t find as many “bells and whistles” as you will with Wix. Business & marketing tools summary: If you require plenty of functionality, Wix has a plethora of features available in their app market and may be the better choice. However, if you want a more basic website without some of the bells and whistles (some of which you may never use anyway), GoDaddy may be just what you’re looking for. It’s essential these days that your website looks good and functions correctly on smartphones and tablets and if it doesn’t, you’re visitors will be off before you can say “mobile-friendly”. Wix has a separate mobile editor where you can go to re-arrange elements rather than just remove them. It might be a little more work but I recommend checking it anyway once your main site is complete just to make sure that everything looks okay as sometimes, things may need moving around before your website goes live. Personally, I prefer this but I know not everyone else will. Wix does have an advantage in the mobile stakes as they allow you to add a “mobile information bar” which once tapped by a visitor, will display your phone number and other contact details. 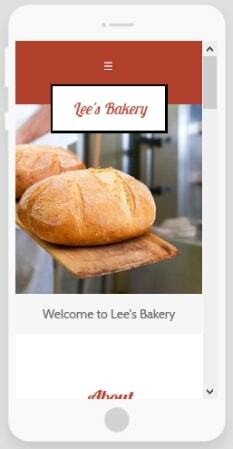 This is great for local businesses as it allows customers to “tap-to-call” from their phones. With GoDaddy, you build your site once and you don’t need to worry about the mobile version as it will look great and function properly with no additional effort on your part! Having said that, you do have the option to remove certain elements from the mobile version if you wish which will come in handy if you want to streamline your visitors’ mobile experience. Mobile summary: Wix allows you to customize your mobile site and has a nifty feature allowing you to display your contact details for your visitors’ convenience. With GoDaddy, you don’t have to worry about your mobile site as it’ll work out straight out the box so to speak and you also have the option to remove elements if you wish. The good news is, both have in-house eCommerce platform allowing you to sell products directly through your website. I always say, if you’re setting out with the intention of creating a large store, you’d be better off using a dedicated eCommerce platform as you’ll save yourself a ton of headaches down the road. Especially, in this case as Godaddy (while they let you import products from a spreadsheet), doesn’t have an option to export them which will mean a heck of a lot of work down the line if you decide to move platforms. 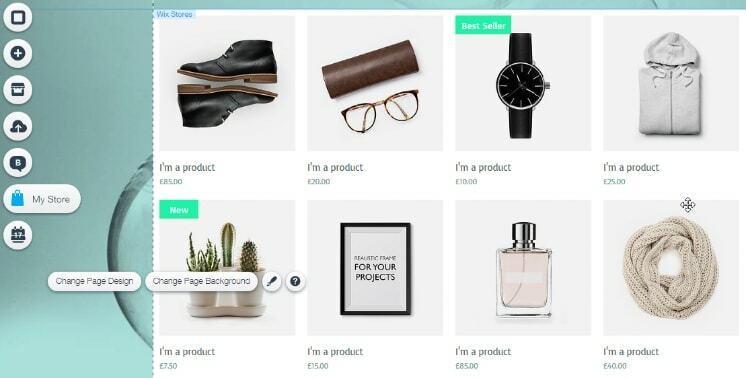 Wix doesn’t allow you to import or export products meaning that neither platform is really suited to people who have hundreds of products to sell, not unless you’re prepared for a lot of work manually adding all of those products details and descriptions that is! However, if you are looking for something a little smaller, both GoDaddy and Wix’s eCommerce tools are straightforward and actually, a pleasure to use. Wix allows you to sell both physical and digital products and their eCommerce plan is a bit cheaper than GoDaddy’s. Especially for really small stores. Both allow you to add variations of each product, calculate shipping and tax costs, and accept payments through PayPal and major credit cards. Just be aware, GoDaddy doesn’t have the capabilities to sell digital products such as ebooks, music, or anything else that needs to be downloaded. eCommerce Summary: Both eCommerce platforms are easy to use. Wix allows you to sell both physical and digital products but with GoDaddy, you can only sell physical. Wix’s blogging platform offers many of the features you’d expect such as using categories, tags, scheduling your posts, and you can also add video and images. GoDaddy doesn’t offer the ability to add a blog. However, if you have an existing blog, you can display it on your GoDaddy site with your RSS feed but that’s about it. Blogging summary: If you require a blog, your only option here is Wix. Both platforms allow you to optimize all of the basics such as page titles, descriptions, and they will automatically create a sitemap for you which can then be submitted to Google and Bing. If you’re sat there nodding your head wondering what the heck I’m going on about the don’t worry! 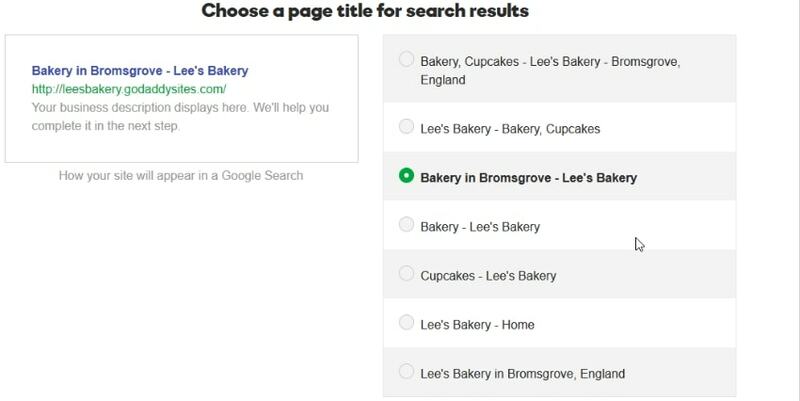 Wix and GoDaddy both have an “SEO Wizard” that will walk you through the process of optimizing your site by helping you choose “keywords” that you’d like to show up for in the search results such as “Bakery + YOUR TOWN. One difference I should point out though is that GoDaddy doesn’t currently allow you to add ALT tags to your images (titles and descriptions). This is not great for your visually impaired visitors or those hoping for their images to be found in the search results. SEO summary: Both Wix and GoDaddy walk you through the basics of choosing keywords related to your business and getting your site ready for the search engines. GoDaddy not allowing you to add titles and descriptions to your images doesn’t make for a great user experience and is a bit of a sticking point for me. Wix has provided me with great support through their email based ticket system and I had my questions answered in just over an hour. As well as email, Wix also provides support through callbacks and their help center. The only thing missing for me is live chat as I prefer it to the phone as I can be getting on with other things if I get put on “hold”. GoDaddy really shines when it comes to customer service. They provide phone support, live chat and a community forum filled with questions and answers. 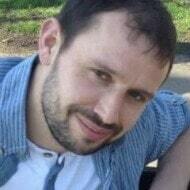 I contacted them through live chat when creating my test site and the chat operator couldn’t do enough to help me which was a refreshing experience regardless of the industry. Help & Support summary: Wix also has a great support platform and you can arrange a callback or use their email based ticket system. GoDaddy is known for their great customer service and you contact them via phone or live chat. Wix offers you a free account website but it does come with restricted features and you’ll also have to put up with advertisements on your site. GoDaddy gives you a 30-day free trial to test things out and decide whether it’s a good fit. Note: To get a fair comparison of prices, the prices below are for 1-year plans and billed annually. Wix’s premium plans range from $5 – $25 per month but I should point out on their cheapest plan you’ll still have ads on your site. 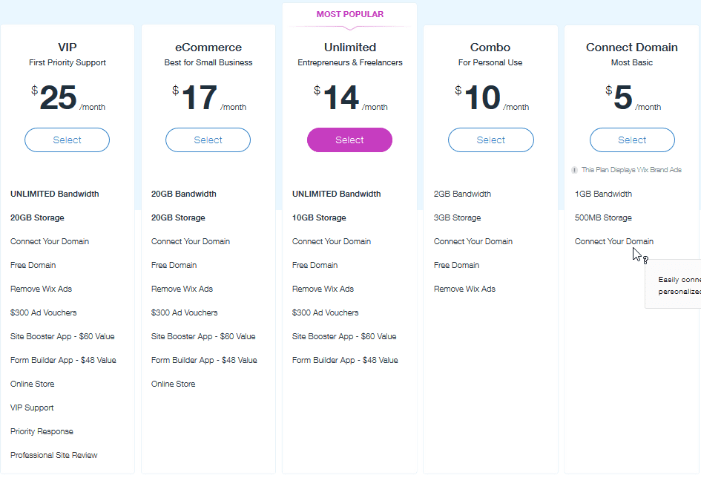 For a business website where you don’t intend to sell products, the Combo or Unlimited plan at $10 and $14/month respectively are your best options. GoDaddy’s premium plans range from $5.99 per month to $29.99 per month. The cheapest plan is good for hobby sites, but if you’re looking to create a website for your business, you’ll need the $9.99 per month plan or possibly the $14.99 if you require email marketing capabilities and social media integration. The pricing difference really shows its face when it comes to eCommerce. Wix’s eCommerce plan is quite a bit cheaper at only $17 per month. If you wish to have an online store with GoDaddy, you’ll have to go with their most expensive plan at $29.99 per month. Pricing summary: Wix offers a free plan (with restrictions) and GoDaddy a 30-day free trial. Premium plans are fairly similar unless you’re creating a store in which case Wix is the cheaper option. Now that we’ve reached the end of the comparison, I hope that I’ve been able to clear things up for you and not just confuse you even more! Wix and GoDaddy have quite a few things in common such as ease of use, a wide selection of great looking templates, robust set of eCommerce tools, good help & support, and for a website without eCommerce, the pricing is similar. Wix is by far the more versatile out of the two platforms thanks to their customizable templates and the plethora of add-on features available in the App Market. In fact, you can pretty much bend it to your will and create just about any type of website you can think of (read the full review). Godaddy has most of the essentials in place (with the exception of a blog) and would be a better choice if you’re looking to create a simpler website without all of the bells and whistles many of which, you may never use anyway (read the full review). If you’ve already made up your mind, you can try Wix or GoDaddy for free. If you have any questions, comments, or you’d like to share your experience with Wix or GoDaddy (good or bad), let me know in the comments section below. I’d definitely appreciate it and promise to get back to you as soon as I possibly can.